This image was made at Sam and Sue Shield's farmstand on Thompson Street in Middleboro. I make regular visits to this farm as part of my on going calendar project for the Committee for the Preservation of Thompson Street. The pumpkin wagon was right in front of some fantastic pink flowers. At sunset, the light was wonderfully warm. This is a great example of how I try to make unique and beautiful images. It is relatively easy to take a picture of pumpkins. It is a little more challenging to make it beautiful. It is very challenging to make a unique pumpkin image. This image is also an example of taking what is given to you. Many times as photographers we set out with a specific image in mind. Many times that image doesn't work out for one reason or another. It is very easy to get frustrated when your plan doesn't work out. 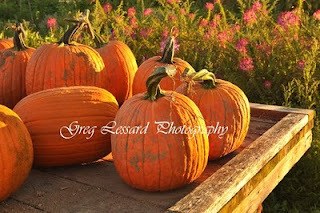 In this case, I had gone to the farm with the hope of photographing some pumpkins that had been on a table next to the white farm house. The pumpins against the shingles of the house had attracted my eye earlier in the day, but they were in the shade. I decided to return in the late afternoon for sunset light. By the time I had come back, the pumpkins had been moved. Instead of giving up, I changed plans and moved towards the pumpkin wagon on the other side of the farm. There, I was pleased to find an even better composition than the one I had envisioned. I often find my photography works this way. I envision a certain image. It doesn't materialize for one reason or another. Then, if I keep my mind and possibilities open, I often find other images. The moral of the story is to take what is given to you as a photographer. Continue to pre-visualize, but be willing to go with the flow. That's funny Carol! I jut emailed you about your blog photo being very familiar:) Its amazing how much you and I see similar things and keep crossing paths. 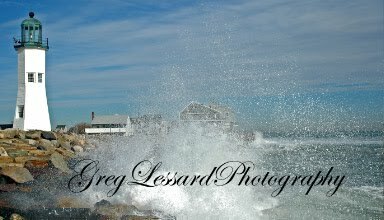 I can't tell you how much time I have spent photographing the North River, Vt., Scituate, etc. Its kind of uncanny. Especially considering we only met a few weeks ago! 2011 Thompson Street Calendar On Sale Now! !